The Piraeus Bank Group Cultural Foundation (PIOP) inaugurates on Friday, December 14 (at 19:00), the itinerant exhibition “From Stage to Museum. Chinese Opera Costumes” at the Foundation’s Rooftile and Brickworks Museum in Volos. The exhibition presents fourteen Chinese opera costumes of fine workmanship accompanied by rich audio-visual material, and a spectacular costume of the ethnic group of the Miao. Note that the exhibits are part of the collection donated by the Embassy of the People’s Republic of China to the Piraeus Bank Group Cultural Foundation in May 2018. The exhibition at the Rooftile and Brickworks Museum will be opened by the Ambassadress of the People’s Republic of China, Mrs Zhang Qiyue. As Mrs Sophia Staikou, Chairwoman of the Piraeus Bank Group Cultural Foundation, said: “This exhibition is a journey that takes us to the fascinating and colourful world of the Chinese opera. It is also an indication of the strong bonds of friendship between the Piraeus Bank Group Cultural Foundation and the Embassy of the People’s Republic of China. The trust shown to the Foundation by both the former Ambassador and the current Ambassadress Mrs Zhang Qiyue is a particular honour for us and very moving, and we believe that this exhibition is only the start of a valuable collaboration”. The Chinese opera, of which the roots date from the 3rd century BC and the period bridging the dynasties of Qin and Han, is an important facet of Chinese culture. It is among the earliest forms of dramatics art in the world. Over the centuries the Chinese opera was influenced by various local elements and linguistic idioms, assuming many different forms. Currently there exist more than 360 types of Chinese opera; the Peking Opera, the Tibetan Opera and the Kun Qu Opera have been included in Unesco’s Representative List of the Intangible Cultural Heritage of Humanity. In Chinese opera, the costumes are as important as the actors. Each represents a story that exudes the unique artistic charm of the Chinese opera. 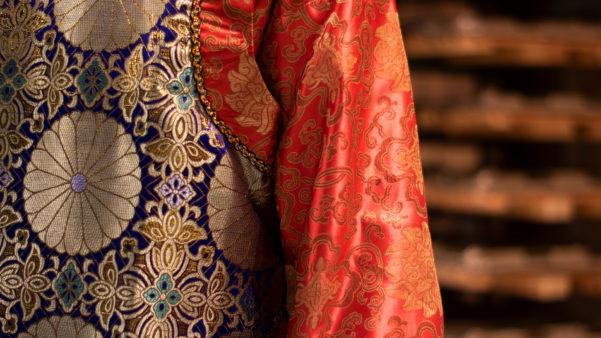 With their characteristic colours, high-level workmanship and great artistic decorative value, the costumes have a significant function, revealing elements of the protagonists’ characters, the plot, and the alteration of different emotions.